In last week's installment of Tower Site of the Week, we gawked - OK, maybe even drooled a bit - over the Art Deco splendor of the WHBC studios in downtown Canton, Ohio. 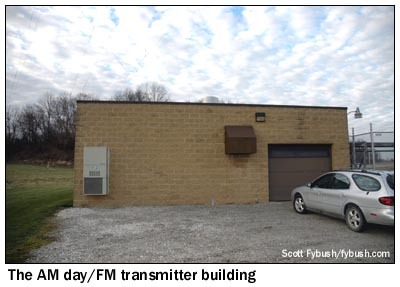 That visit was in September, and as we left, we promised to get back to Canton before chief engineer Bill Glasser's February retirement to see his transmitter sites. In mid-December, we made good on at least half of that promise, making a stop at the WHBC(AM) daytime/WHBC-FM site north of Canton on the way home from yet another Fort Wayne visit. No classic Art Deco out at this site a dozen or so miles north of Canton, on Diamond Road in Middlebranch, Ohio - and for good reason: it was only built 20 years ago! Until then, WHBC (1480) and WHBC-FM (94.1) had a single transmitter site, in an industrial part of town closer to downtown Canton. But the growth of industry around that site eventually created too many problems for the AM station's directional pattern. 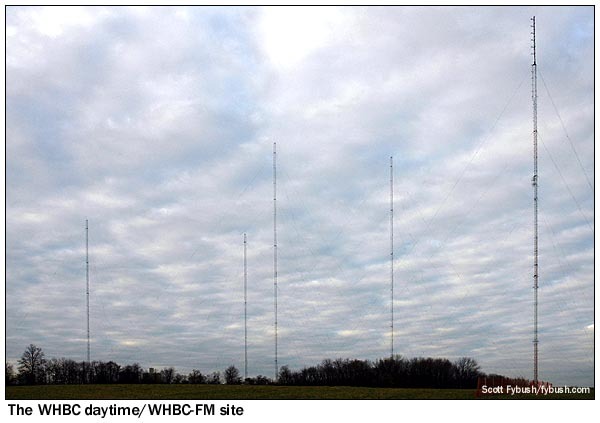 So WHBC built two sites: this one, north of town, with a 575-foot tower for WHBC-FM and two 335-footers for the 5 kW daytime directional pattern of WHBC(AM), as well as a four-tower site south of town for WHBC(AM)'s 5 kW nighttime signal. The garage, in turn, takes us into a compact but well-arranged transmitter room. 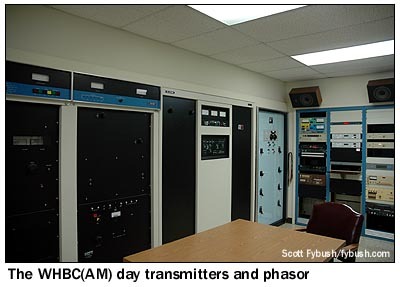 On one side of the room are the AM transmitters: the DX15 (the first of those we've ever seen!) 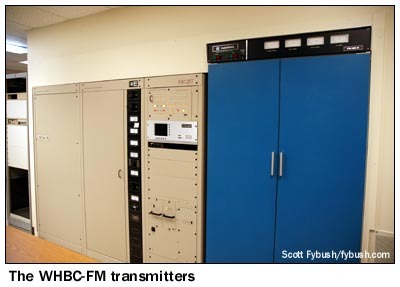 that's WHBC's primary unit, as well as a backup MW5 and the phasor; on the other side are WHBC-FM's main BE and backup Harris transmitters. (Each row of transmitters backs up to an enclosed positive-pressure space that simplifies air handling and keeps the transmitters nice and clean; you can see where the rooms exhaust to the outside of the building in the exterior photo above. Between the two rows of transmitters sit the racks full of STL, telemetry and processing. A small shop area, and that's about it. Thanks to Bill Glasser for the visit! The Tower Site Calendar 2007 is here! They're going to sell out, just like 2006 did - order today at the Fybush.com Store!